A reader just left a comment (thanks, Cynthia) that points out a slight problem with the new Kindle Touch 3G that you should know about before ordering. Unfortunately it looks like Amazon is making a change to the way they offer free 3G wireless on the Kindle Touch. Kindle Touch 3G’s experimental web browser is based on WebKit. It’s easy to find the information you’re looking for right from your Kindle Touch 3G. Experimental web browsing is available via Wi-Fi. With the Kindle 3 and other earlier Kindles, users could use the web browser when connected to 3G to look-up something on Wikipedia, run searches online, check email, etc. Now with the Kindle Touch the web browser only works with Wi-Fi, which essentially means that the Kindle’s 3G wireless is only good for shopping the Kindle store and having ebooks and periodicals delivered. Personally, I would not have ordered the 3G version had I known that yesterday. Amazon is charging $50 more, which is a whopping 50% increase over the Wi-Fi only Kindle Touch, just so we can purchase more ebooks and periodicals from Amazon when away from Wi-Fi. Kindle Touch 3G makes it easy to find what you’re looking for. Just enter a word or phrase and Kindle will search every instance across your Kindle library, in the Kindle Store, on Wikipedia, or the Web using Google search. At least it looks like the sharing features should work over 3G; there’s no Wi-Fi disclaimer for that. And of course you can still have personal documents and other ebooks delivered over 3G to the Kindle Touch if you are willing to pay $.99 per megabyte. Not having web access over 3G is going to be a big surprise for some, especially previous Kindle owners expecting to have it since the other 3G models do. For those that want 3G web access, they’ll have to go with the Kindle 3, now known as the Kindle Keyboard. It seems stupid that Amazon would offer 3G web browsing on one Kindle and not another. While it may be disappointing, if they make the web browser more functional than it currently is, and I suspect they have, then I certainly can’t blame them for doing so. 3G is too expensive to allow people to do serious web browsing. I just hope opening links in a new window is enabled. I second links opening in a new window. 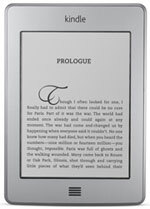 If they make that work, then you could use the web browser to shop and download library ebooks directly without the need of a computer at all, since that is the only thing stopping the Kindle 3 from doing so. Update: A number of folks have contacted Amazon about this issue and customer service is saying that the Kindle Touch will indeed be able to use the web browser over 3G. At least in the US. Internationally it is a different story, which isn’t unusual. Guess we’ll have to wait until the end of November to know for sure. Wow. My first mention. I will how Andrys from KindleWorld will take the news, considering she had a ton of tips about how to get the most of your Kindle browsing experience. The wording could also be interpreted as browsing also being available via wifi. I hesitated when I bought my Nook Touch, only because of the Kindle’s ability to be a quick anywhere browser for emergencies if you are traveling internationally. I saw it as a real selling point. I’m very happy with my Nook Touch (though I wish the browser was fixed), but the fact that Amazon did this is a major setback for one of their strongest selling points for international travelers. So no web browsing via 3G. Hi, Nathan…I don’t like the idea that one cannot try out a Kindle. I was at our local Best Buy and while they had brands on display they weren’t operational. What good is that?! Because Barnes and Noble does a good job promoting and letting people get a feel for using a Nook at its stores, I still may go with getting a Nook. Amazon’s return policy is very easy so don’t worry about it. You can try the Kindle out for 30 days. If you decide you don’t like it you can send it back. They charge you for return shipping but it’s only like 2 bucks. seemed GREAT but I won’t be buying.